Screen shot of HPR mobile app home screen. Annotations show Menu, Play, and Share buttons. Just update your old app. And thanks. 3. What are some of the features of the new app? You can choose between either of our two streams, HPR-1 and HPR-2, and jump back and forth between them any time. 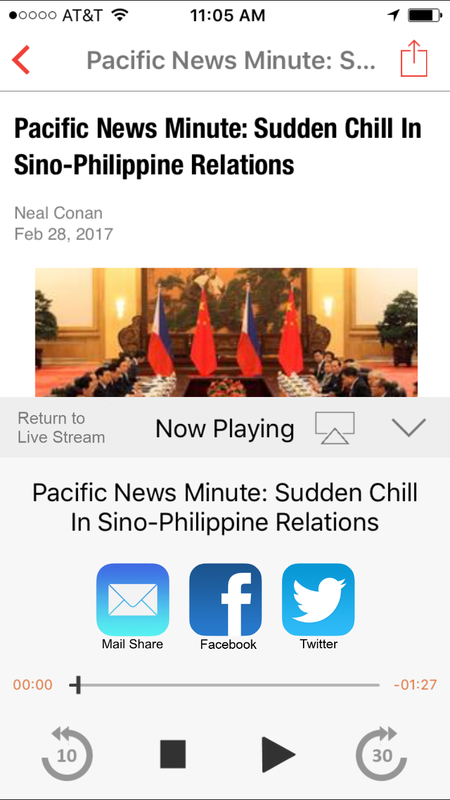 Once you’ve selected a station, you can stream what is currently on the air. See the “Play” button at the bottom of the screen, with listing of program title. You can “Pause” this audio for up to 10 minutes and when you re-start by pressing “Play”, you’ll resume where you left off. To listen while you’re on another app on your device, simply press your device’s “Home” key to go to that other app. 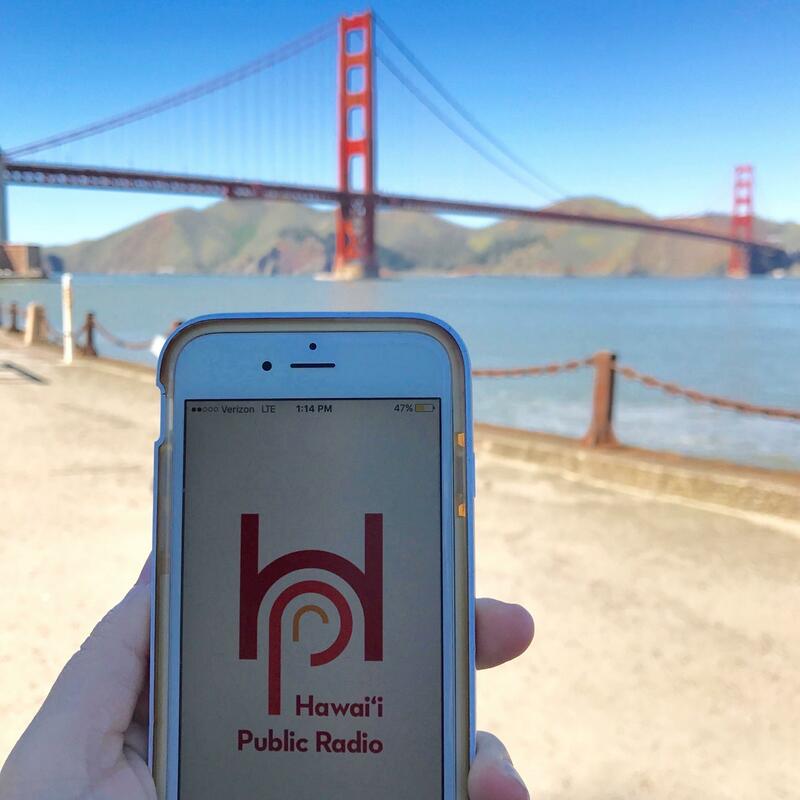 Many of our music programs (including those produced here at HPR) will display the current piece at the top of the screen, while you’re live streaming that program. And here’s a cool tip: click on that program, i.e. under the "Local Classical" section, click on “Morning Café,” and on that program’s page, you’ll be able to see the composer, performer, name of album, and a link to purchase the CD! See image at bottom of this page. You can also find past local and national news/talk segments or programs listed under a variety of categories (“Local News” or “Arts and Culture”), and even special topics like our popular Hawaiian Word of the Day. 4. How do I share something I've heard with a friend? Screen shot of Share feature. Start by playing the segment (press "Play" at the bottom of the screen). To the right of the program's/segment's title, you'll see an upward-pointing caret ^. Click on the caret to reveal the Share screen. Select any of the options available, i.e social media, email, etc. 5. I’ve heard about On Demand? What does that mean? You’ll find our On Demand section by pressing the Menu button in the top left corner of the screen, then selecting “On Demand.” You’ll see there many shows that we carry on our stations, as well as some that we no longer or do not carry, such as “On the Media” or the podcasts "Serial" and "S-Town." Tap the show’s icon and, when available, you can listen (on demand) to a show which has previously aired. Click “play the entire show” or just one of the segments listed. Scroll back or forward (<< arrows >> on either side of the date at top) to hear programs which aired earlier or later. Screen shot of donation feature. 6. Can I donate to HPR via the mobile app? Yes, this is a feature we’re very excited about. With a simple click of the “Donate” button in the top right of the home screen, you’ll be able to donate now via a secure, easy, online form. If you're accessing the app from your phone, you can call us directly (during business or pledge hours) to make your donation. Screen shot of Morning Concert playlist.